As I said in the main post of this serie, I don't mean to propose a new flag to São Paulo. 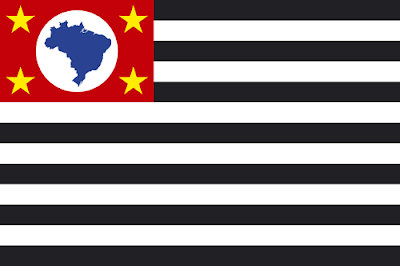 My reasons were in that page, but I'm going to summarize them: São Paulo's flag isn't exactly the most beautiful flag in world, but it has a great symbolism. According to him, the symbolism is that: the blue stripe is the Atlantic Ocean, the red is what Brazilians know as "purple soil" (very adequate to coffe growing, what helped São Paulo to became the richest state in Brazil), the golden star is wealth and development. In that blog you can find other two versions: one with a shape more similar to the state coats, and one with a white band that harmonizes the design and represents the coastline. The second proposal, above all, is pretty good, but I still don't know if I should change São Paulo's flag. And what's your opinion? Comment below. That blog is with a poll to decide which of three designs is better. Participate! I'm here to communicate that the blog domain changed from www.create-recreate.blogspot.com to www.create-recreate.blogspot.com.br. The Blogger is with a new policy of changing domains from American to local servers. The main reason is copyright claims: fair use and other cases isn't crime in USA, but it's, i.e., in Brazil. At first time, www.create-recreate.blogspot.com will be redirected here, but I don't know how it'll work from now, so I suggest as soon as possible you to accustom to the version www.create-recreate.blogspot.com.br. P.S. Flags and similar symbols are, with rare exception, in common domain, and I don't use to utilize content by other authors, so my blog doesn't have, fortunatelly, any danger of turn off. You can't believe! I'm participating in a culture exposition, and I received USA as my country theme — was Germany, but I change with mates... Yes, it's a true story! The good part is that I know a lot about USA. The bad is that everybody knows a lot about USA. So I want to show a big lot of informations. I'm working with a more beautiful eagle, but it's a draft. If I really utilize it, I'll fix colors, etc. The exposition is scheduled to the second half of August, and I'm inviting you to colaborate with ideas. Furthermore, I'm planning to constroy a 3D US Air Force roundel, because I love roundels and it rare in Brazil to know somebody that knows about them. Castle, camps, mountains... it's only missing the great German forests. It's a pity it's useless. I'm saying the truth, I'll really enjoy your participation! You just need to put links to ideas in comments section in this post, and you might win some credit. My current version of flag... I'm working in some fixes. 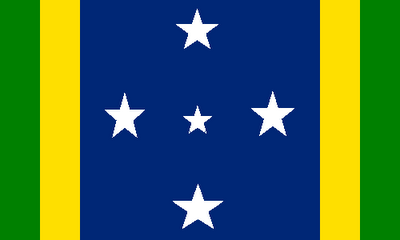 Traditionally, the stars layout is said to symbolize the first colonial names of Brazil, Ilha de Vera Cruz ("True Cross Island", when Brazil was considered a island yet) and Terra de Santa Cruz ("Holy Cross Land"). The state is considered the heart of Brazil, and a flag like this is a good way of symbolize it. Oh, I must not forget the Piauí! 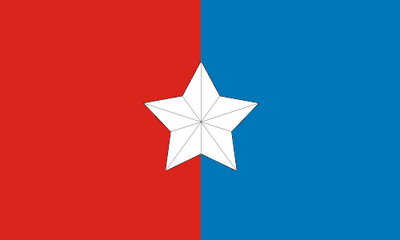 The first Piauí flag had a square canton and no written. This is a date, March 13rd 1823, day of a victory by Independentist Troops in state territory — I should admit that I never knew before about this battle, and it's unimportant, because Brazil made probably the most peaceful independence in Iberic South America, and the Piauí had, at that moment, about 12 years of existence. I'll be original and keep the retangular star, but without the written. I must thanks Jack Expo, that give me the idea to this post. 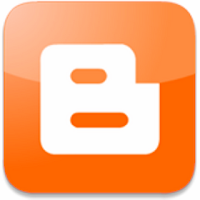 Are you liking my blogs? Follow and give me comments. The red, white and blue is a clear reference to French flag, and means the motto "Liberty, Equality, Fraternity". The most curious is the coat of arms, that references to the three oldest Alagoas villes: Marechal Teodoro (early known as Alagoas) (three fishes in blue), Porto Calvo (three red mountains) and Penedo (a castle in a canyon). 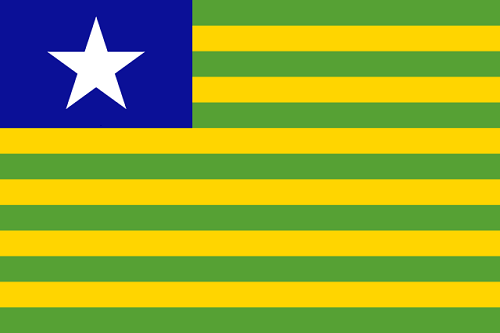 The star, as I explained in last post, means that Alagoas is a state in Brazilian federation. My new proposal would be based in an older state flag, but it's worse than the new. I personally like the colors of Alagoas flag, so I mantained them. 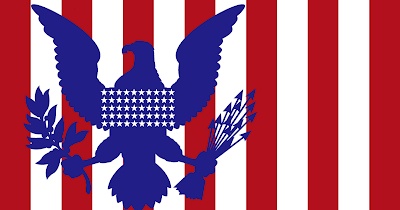 I simplified the flag. The star is a very important symbol in Brazilian vexillology, so it remained. As a white star on a white stripe is a wrong thing to made, I dropped it. This star could be simplified, but for now I'll keep it this way. 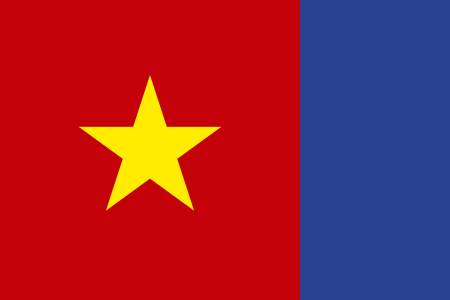 There's a similar flag from People's Republic of Wiscounsin, but, come on, this doesn't exist! Are you enjoying my serie about Brazil? I want to know your opinion. Comment, please! I'm posting with some regularity. Follow me to know the news. (Click here to see image in bigger size). 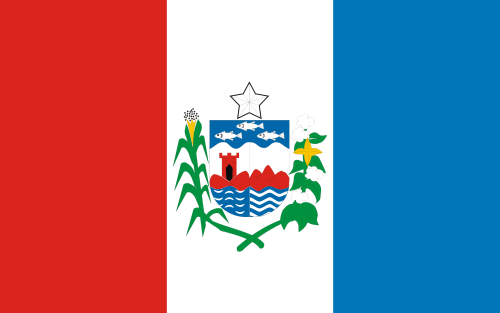 Acre is OK, a beautiful and historic flag. 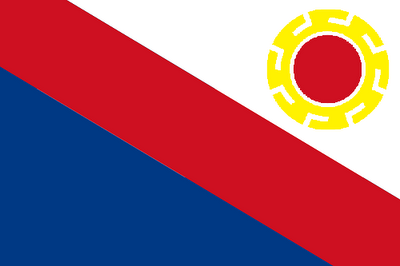 Alagoas needs a new flag; I'm already providing one. Amazonas needs a new star disposition. This flag and the one of Bahia are very resembling, maybe I change one of them. Amapá is OK (looks prettier in high definition). Ceará... I showed you my proposal. 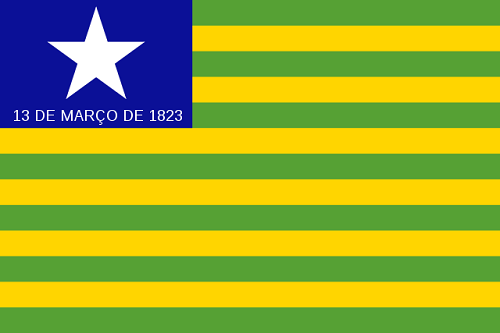 Espírito Santo is a good tricolor; would be advisable remove the written, but it makes the flag better, for me. 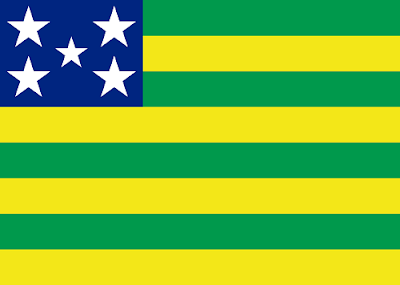 Goiás has a good flag, but very similar to Sergipe, isn't? Maranhão, Mato Grosso and Mato Grosso do Sul is OK.
Minas Gerais has a flag as isn't made anymore, but it's a so powerful symbol that could be the Brazilian flag — some historians suspect the triangle should be green, but red is a good choice. Pará is OK.
Paraná flag should be simplified. Pernambuco is a very polluted flag, but someway appropriate to state history. This version in image is the old Piauí flag, for me, the better. Rio Grande do Norte and Rio Grande do Sul should be changed (I'm working in ideas). Rio de Janeiro, too. Rondônia and Roraima are fine. Santa Catarina should be fixed. São Paulo... I'm from this state! This flag was an old proposal to Brazilian flag, and during 1932 was used in fight against dictatorship by Paulista people... It's not perfect, but a very respectable flag. Tocantins is the newest Brazilian state, and has a very beautiful flag (their capital, Palmas, has one of most beautiful flags I ever seen). The Federal District ("Distrito Federal") is somehow a tribute to Oscar Niemeyer, one of world biggest architects, and really amazing. It was a very long post, friend, isn't it? What's your opinions and expectations about the serie about Brazilian states? Comment! P.S. Have you ever realized how many Brazilian flags have a star? Brazil national flag has 27 stars (from 26 states and Federal District), and it's a cute way of say they're Brazilian states. This is my first post about a Brazilian state. 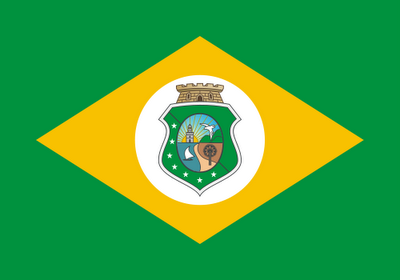 The majority of Brazilian state flags are simply great - but, unfortunatelly, I can say it about the Brazilian city flags. 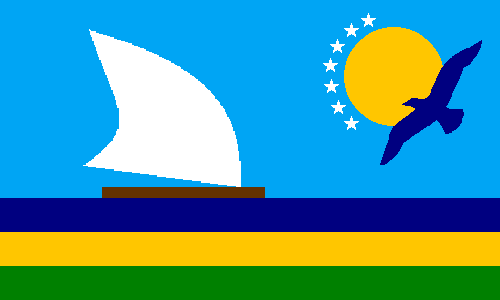 However, I made a imagination exercise and tried to create a new flag to Ceará, that doesn't have exactly the most beautiful Brazilian flag, for me. The Ceará is a sunny handsome state, and its coat of arms get a sense of what would symbolize the state: the sun, the sea, the mountains, the sertão (backcountry), the Mucuripe lighthouse, a bird, the carnaúba (a local tree) and jangada (local raft). A lot of symbols! Reluctantly, I did the fist step: dropped the Brazilian flag background. My first try was very resembling to the coat of arms, but it seemed very saturated, so I dropped the lighthouse and carnaúba. The jangada, the sun and the bird remains, and I utilized the other elements in a more subtile way. I kept the seven stars, that symbolize the number of Ceará mesoregions, and the green and yellow is yet there, but this time as elements of landscape. I tried to put the Brazilian colors in the sail, but it didn't work as fine as the pure white. I'm half pleased to it, but I wish it would be simpler and more striking. Thank you for reading this post. I'd like if you told me your opinion. I'm thinking in doing more posts about Brazilian flags. What's your opinion about that? Comment. But it's just the first Catamarca flag, and they're still forming their visual identity. 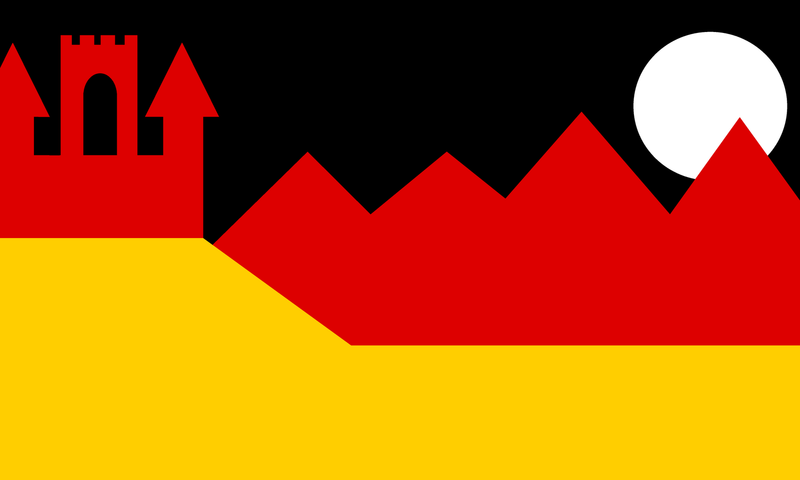 An aspect I don't like in the flag is the May Sun. This symbol is among the most meaningful and remarkable of the world. But currently it is in Argentine national flag, Uruguayan national flag, and aproximately five Argentinean provincial flags and three Uruguayan departmental flags. 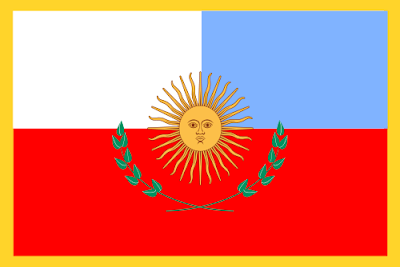 The core of my proposal comes from the Artigas' Flag, early used by the United Provinces of the Río de la Plata, a confederation of Argentina and Uruguay. 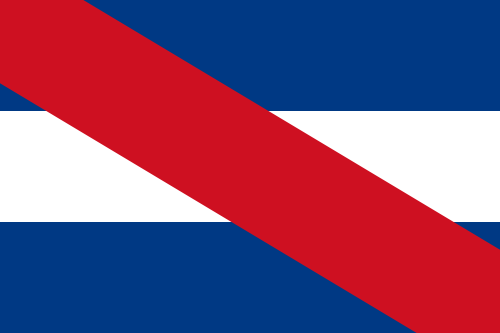 Historians indicate that this was the first flag ever to be flown in Catamarca — a version of this flag is currently used by Entre Ríos province in Uruguay, and as Uruguayan narional banner. As always, I hope you liked my post. Comment and follow my blog, please. P.S. As Brazilian, I meet everyday a lot of other Brazilian people that don't like Argentina (some of them actually hate), but I don't think like that. Our resemblances are very bigger than our differences. Obviously, I prefer Brazil, but I don't think Argentina is in the bandit size.